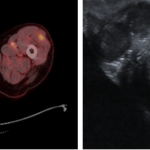 Multiparametric MRI images (coronal view) demonstrating PIRADS 5 signal abnormality in the right peripheral zone of the prostate. A PIRADS 4 lesion can also be seen in the right transitional zone. Images from MRI/US fusion biopsy procedure demonstrating biopsy targeting of the right peripheral zone lesion. 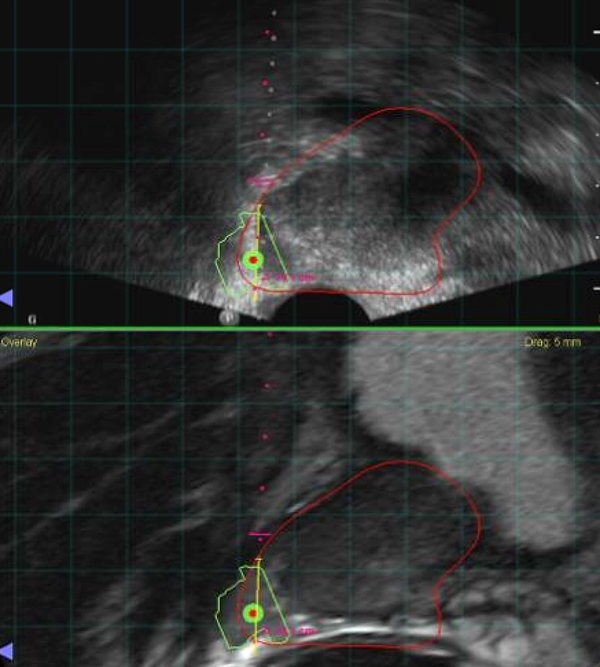 A 64-year-old man with history of elevated PSA (8.5 ng/mL) and previous negative prostate biopsies underwent multiparametric prostate magnetic resonance imaging (MRI). PIRADS 4 and 5 lesions were identified in the transitional and peripheral zones with the latter lesion exhibiting evidence of extracapsular extension. A 12-core template biopsy with additional MRI/ultrasound targeting of lesions identified on MRI demonstrated large-volume Gleason 3+4=7 disease. The patient underwent an uneventful robotic prostatectomy and bilateral pelvic lymph node dissection. Pathology confirmed T3a, N0, M0 Gleason 3+4=7 disease with negative surgical margins. The patient’s PSA at 6 weeks following surgery was undetectable. This case was prepared by Alexander Kutikov, MD, of Fox Chase Cancer Center in Philadelphia. Suardi N, Gallina A, Lista G, et al. Impact of adjuvant radiation therapy on urinary continence recovery after radical prostatectomy. Eur Urol 2014;65:546-551. Den RB, Yousefi K, Trabulsi EJ, et al. Genomic classifier identifies men with adverse pathology after radical prostatectomy who benefit from adjuvant radiation therapy. J Clin Oncol 2015;33:944-951.